Get more bass from your SoundBucket - SoundBuckets! We’ve all been there, and while the SoundBucket has a lovely bass, sometimes you just want more. Well there are two tricks you can do to boost the bass from your SoundBucket, and one of them will work on any small speaker. Your SoundBucket has a “dim” mode, where it lowers the level of the music, but keep the level of the bass the same. This is great if you want to listen at a lower level, but still want great bass. However, who says you’ve got to turn the volume down as well? With the SoundBucket on, just tap the lid – the LED will flash yellow, and you’ll notice the level will drop. Just turn up the music to the max, and you’ll hear that the bass is a lot louder than the rest of the music. Result! Just remember to turn the volume down before you tap the lid again to un-dim it, or the level will come right up! You can concentrate the bass, so making it louder, by placing your speaker next to a solid boundary. The floor is a good example. Just by placing your speaker on the floor, the bass level will come up. If you place it on the floor, against a wall, it will be louder still, and for the ultimate loudness, place it on the floor, in a corner! Because the SoundBucket is cylindrical, it fits really well in the corner, so give it a go when you’re looking for the ultimate bass level. You’ll get lots of bass and you won’t damage the speaker. Please note some other speakers may sound a bit weird in the midrange and top end however. All speakers radiate bass notes in all directions. A single bass note is like an ever expanding sphere of sound created by the bass driver. This sphere will keep expanding until it hits a reflective object like a wall or floor. It then bounces like a snooker ball all over the room, hitting other reflections and objects etc. The power or energy of that bass note is contained across the whole surface area of the sphere. This is why sounds get quieter the further away you are from the source – that same energy is spread across an ever increasing sphere. Now when we put the speaker on the floor, half of the sphere hits the floor, and because the bass notes have a long wavelength, it bounces back almost immediately and re-enforces the other half of the sphere that isn’t bounded by the floor. Suddenly you’ve got twice as much energy coming towards you. Place it against a wall and 3/4 of the sphere is coming towards you, and in a corner 7/8ths is sent towards you. The walls focus the bass towards you instead of reflecting it off other walls, and dissipating it. Of course, you can’t get something for nothing! The higher frequencies, having a shorter wavelength, bounce off the adjacent surfaces and interfere with rather than re-enforcing the signals. This often makes a weird midrange sound, unless the speaker fits tightly into the corner. 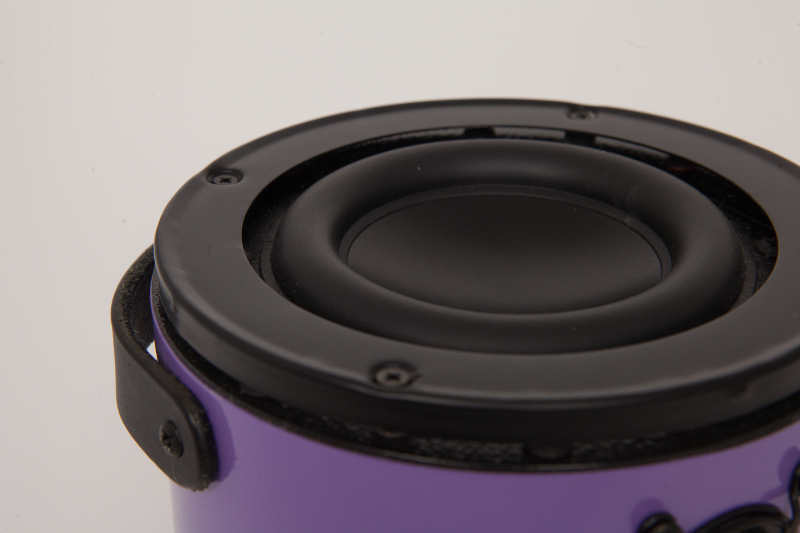 It also emphasises the bass response of the speaker, so the typical portable speaker will sound boomy and a bit like it’s only playing one note. Thankfully the SoundBucket has a solid well controlled bass, so it will sound pretty similar, just louder.